When I want to comment on something relatively current, I will do it here. Not necessarily in sync with the Swedish site. This year we had more luck with the weather at Eslöv. 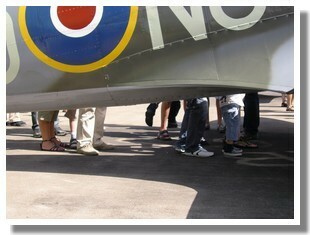 On August 22, it was fly-in time again with a lot of interesting aircraft at the airfield. Despite the fact that I live only ten kilometers from there, I had not yet seen Sten Svensson's T-28 in the air, so that was very nice. 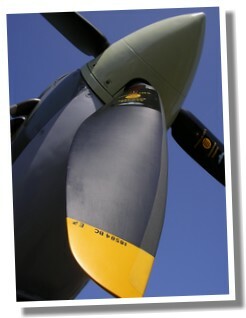 A lump of metal on the ground, yet so graceful in the air. But the moment of the day was a ride in a Cessna 172, with possibilities to take the controls yourself and a fly-by of our house. It's always fun to fly small airplanes. The day after it was time for Roskilde Airshow. Most things are the same from year to year, I'm getting a little tired of some parts of the show. But there is always something new, and this time it was a little extra: the Red Arrows from England. It was everything one could have hoped for and more. Swedish Team 60 is in their shadow, even though they are also extremly skilled pilots. As usual, I did some filming, so have a look at the video and enjoy the art of flying at it's best. Red Arrows at Roskilde Airshow, Augusti 23, 2009. Aviation history was really made on Sunday, November 2, when Mikael Carlson's newly built Fokker Dreidecker took to the skies for the first time. It stayed there for 23 minutes and everything went well. The aircraft has an original 1917 power plant, a rotating le Rhone of 110 hp, and could therefore be said to be more genuine than other replicas which are often powered by newer engines. Mikael's chosen paint scheme is the one used by Johann Janzen in Jasta 6 in March of 1918. The maiden flight of Mikael Carlson's brand new Fokker Dreidecker 1. Last weekend of August was a treat for anyone - with a passion for aviation, that is - who happened to be on the Swedish west coast. 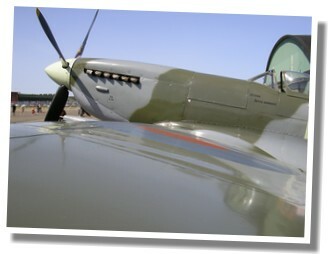 It saw the premiere of the Göteborg Aero Show at Säve airport, the largest airshow in Sweden this year. 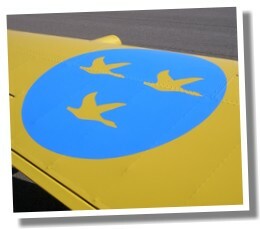 The theme was Swedish; aircraft built in Sweden or owned by Swedes, so there were no foreign displays this time. But there are plans for expansion and the whole thing seems to become a yearly event. You could tell it was a first timer, some things didn't run as smoothly as they could have, but all in all it was a great weekend. The airfield at Säve is perfect for airshows. Saturday we placed ourselves on a small mountain and had a splendid view of the displays, and Sunday I spent on the grass studying the parked aircraft in more detail. 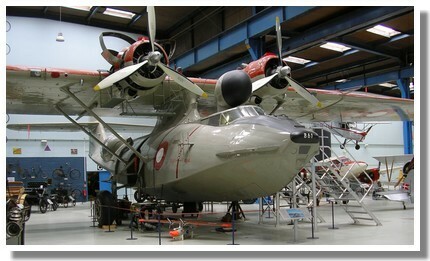 Aeroseum, a new museum situated in a cold war-days super secret underground shelter, was also very interesting. Well worth a visit now, but given a couple of years it could become really good. A small cavalcade of what was offered during the weekend can be enjoyed below. More and longer videos can, as always, be found on YouTube. Mixed goodies from the first edition of the Göteborg Aero Show. Skånes Veteranflygförening (Veteran Flying Association of Skåne) arranged its yearly fly-in at Eslöv airfield last Saturday, and many nice aircraft had gathered for the occasion. Alas, intense raining put a stop to my taking part in any activities. I went there and home again and almost got stuck in the mud. One of two pictures I managed to take through an open car window before the risk of serious water damage to the camera made me abort further photographic attempts. Eslöv airfield, August 23, 2008. 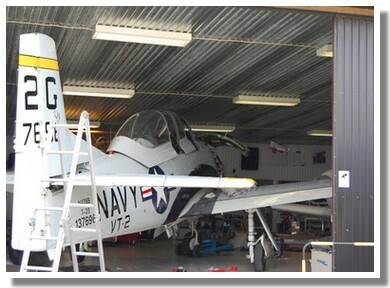 The T-28 Trojan that has Eslöv airfield as its new base seems to be getting close to airworthy status. I had a peek today inside the hangar (where it must have been quite a challenge to squeeze it in) and it looked like in the picture below. 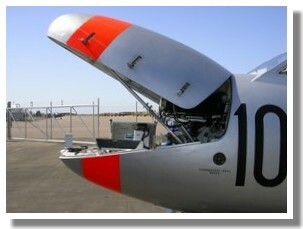 Mechanics were busy mounting small plates beneath the tail plane. A Consolidated Catalina and a Gloster Meteor, both in Danish service in the 1950's, are the collections' representatives in these pictures. 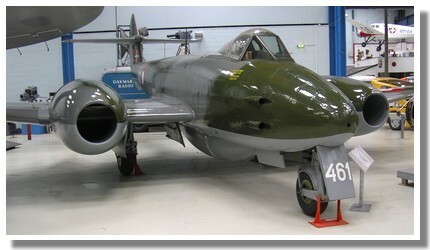 Very interesting was an ongoing project to build a replica of a F.F. 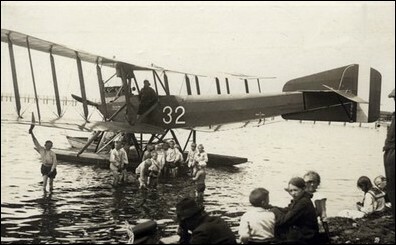 49c, a biplane used in both military and civil aviation in Denmark in the 1920's. 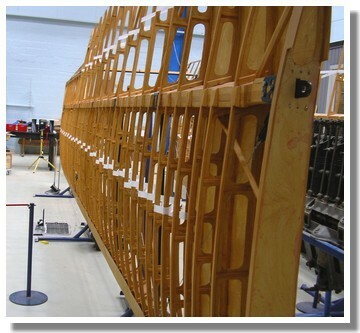 It is the civilian version that is being built, a replica of an aircraft used by DLL - Det Danske Luftfartsselskab - as they started commercial air service in 1920. F.F.49c at Stege, Møen 1919. Picture from the project's archive. 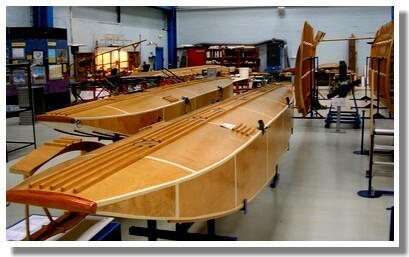 The work is carried out in the open in the museum, so you can stroll around half-ready wings and pontoons and talk to people involved in the project. 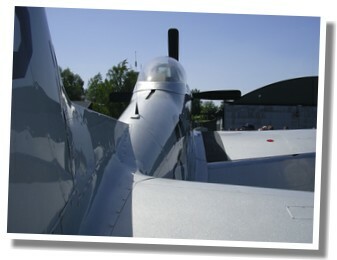 On the very last day of May, LAS, Ljungbyhed Aeronautical Society, arranged a small air show. A Safir-meeting was also held, so about twenty Saab Safir were parked along the runway. Quite a lot of different displays were on the program, ranging from Tiger Moth to Vampire. But the best and most exciting part was that Bertil Gerhardt had brought along both of Biltema's jewels, the Spitfire and the Mustang, and displayed them well in the air as well as on the ground. I filmed a lot, as usual, and parts of it will surely turn up on this site sooner or later. In the meantime the films can always be viewed directly on YouTube. Some nice stills were also shot, here is a small selection. I went to the Eslöv airfield the other day, around lunchtime. Not much going on in the air, only a police helicopter landing to refuel. But on the ground was a lot of activity! Skydivers getting themselves ready, and general maintenance going on inside and outside some of the hangars. A Tiger Moth was pushed outside to make room for a Focke-Wulf FW 44 Stieglitz, designation Sk 12 in the Swedish Air Force, which was stationed as a trainer in Eslöv until the German invasion of Denmark and Norway on April 9, 1940. Now its engine needed some adjustments before taking to the skies. Unfortunately, I couldn't stay long enough to see if the Sk 12 got off the ground later that day. 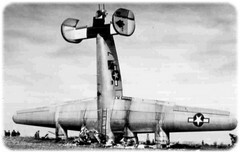 Sk 12 SE-BWU engine testing. Eslöv airfield on May 24, 2008.